As you may already know if you follow us on Instagram, Facebook or Twitter, we here at LICKALIX love Halloween! Recently we had a look around the web for some costume inspiration and came across some fruit-tastic costumes that are way to good not to share with all of you! Two definite winners in the fruit category are these two costumes by Studio DIY and Beverlys. Not only are they super cute, they're also both super easy DIY costumes. So grab some fabric and a glue gun, follow the links and get crafty with us! And have you seen this adorable cookie costume yet? In our opinion this little smart cookie looks so sweet we might have to give the costume a try ourselves and make a grown up version out of it. Another amazing costume for all of those that love sweets is this Croquembouche outfit that was also made by the talented Kelly from Studio DIY. Who doesn't want to look très chic while being a delicious french dessert for Halloween?!? 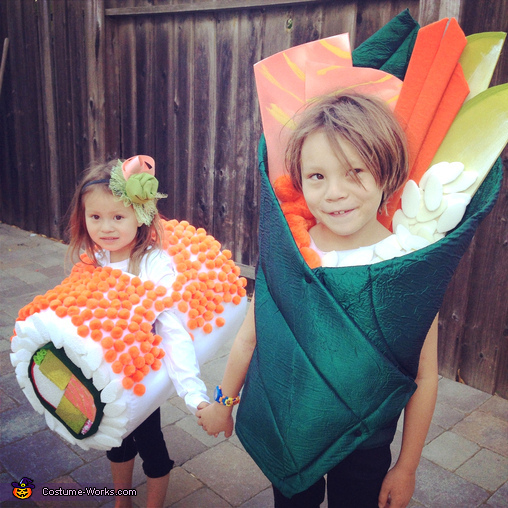 For all you sushi lovers we found this adorable kids costume on costume-works. We recon that this would also make a great grown ups costume, especially if you are going as a group! Coming back to fruit themed costumes why not DIY this amazing exotic costume idea by misscabrine? We absolutely love the idea of dressing up as a dragon fruit this year! So creative! Since we love frozen treats we can not leave this post without one of our favourite costumes by Kelly from Studio DIY. This DIY for frozen yogurt is right down our alley. All you cake lovers out there we are sure that with just a few modifications you can turn this fro-yo design into a cup cake as well! These are just a few of our favourite food related costumes. We are sure to give at least one of them a try this year, so which one should we choose? If you stumble upon some more dress up ideas or are creating any yourself we would love to see them! So make sure to send us some pictures of your Halloween adventures!